The Christmas Miracle is an inspiring account of a true story passed down through the generations in author Marjie Shaw Chamberlain’s family. Not only does her heartwarming story give the young reader a glimpse into the early life of the pioneer family and settlers, but it reassures us that God is ever present in our lives watching over us. It is a kid-friendly, as well as pious look into early American history, perfect for children’s Christmas perspectives. The narrative involves Grandma Em passing on the family story to young Kathy on a cold Christmas Eve. Shaw has spent the past several years researching the trials and tribulations of those individuals of her ancestry who emigrated from the east to California and sharing their story. The result is this children’s book of faith and strength surviving many trials. Marjie Shaw Chamberlain’s current focus is on her avocation for writing strong, enduring stories of pioneers. 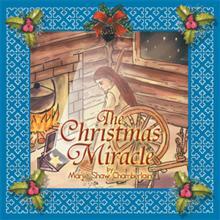 The Christmas Miracle, it is hoped, will be among the first in a series by Chamberlain or a trend among authors of children’s literature that features inspiring, if not amazing, stories of pioneer culture. If well presented, as Chamberlain’s volume is, this kind of books will be a solid foundation for kids to base their faith and belief in their ancestors. It provides them as well with a sense of belonging in history, giving them the facility to act on historical continuity as best they can. Chamberlain knows her stuff–she gives her youthful readers the perfect key to their historical rights. This book will be featured at the 2013 California Library Association Book Exhibit in Long Beach, Calif., on November 3-5, 2013. Marjie Shaw Chamberlain, born in 1942 to Edgar and Grace Beekman, is a sixth generation descendant of pioneer settlers in Ventura County, California. Although the author spent most of her adult life in the corporate world, obtaining several lifetime teaching credentials, she has always maintained a deep interest in her heritage. She has spent the past several years researching the trials and tribulations of those individuals of her ancestry who emigrated from the east to California and sharing their story. She and her husband, Bob, now live in northern California as she continues to research and write about these strong enduring pioneers.